If I'm honest, I think I only watch the World Cup for the dismissals. International football's biggest tournament has a way of elevating everything it touches. There have been countless better goals than Diego Maradona's second against England, but the combination of place, time and significance means that it looks set to remain as THE goal. Likewise, there's no indisipline quite like World Cup indiscipline. People rightly argue that it is a shame that George Best or Ryan Giggs never got the opportunity to grace the World Cup stage, but I feel just as much of a sense of loss for Pat Van den Hauwe or Vinny Jones. Paul Scholes played at two World Cups, but I always got the impression that he never meant to be that bad at tackling. He was never a true artist in the same way as Julian Dicks or Vinny Samways. To celebrate this finest of the fine football arts, in association with Twohundredpercent I have designed a range of 25 collectible World Cup Red Card Cards, available as greetings cards or postcards. Now other fans of ill-discipline can assemble their very own treasury of the most notable World Cup moments and relive their very favourite wild fouls and outrageous pieces of referee-deceiving fakery. It's sure to bring football into disrepute and the first batch off the shelf will be no doubt heading to FIFA headquarters and the office of Mr. J. Blatter. FIFA, of course, are continually trying to clamp down on such foul play, potty mouth and various other monkeyshines. However, for the committed fan of the red card, these efforts are nothing but good news. Their chosen method to bring transgressors back into line is to encourage the referees to pop the cards out until they learn, as though they are misbehaving dogs. The only worry red card connoisseurs have is that one day they might, along similar lines, try to reverse the trend and instead reward players who toe the line. Referees taking to the field with a string of sausages or a pocket full of Haribo instead of a notebook and pencil remains my worst nightmare. 159 players have been dismissed in the nineteen World Cup Finals tournaments so far, to 157 different miscreants. Cameroon's Rigobert Song and France's kung-fu master Zinedine Zidane are the only repeat offenders, while Argentina's Leandro Cufré is the only player to be given his marching orders without having set foot on the field of play. 159 in 772 matches equates to a rather meek-looking 0.21 dismissals per match. However, it is a rather misleading statistic, because it is becoming far more prevalent. In the first nine World Cups, just 22 players were invited to leave the field early. In both 1950 and 1970, no-one was sent off at all. 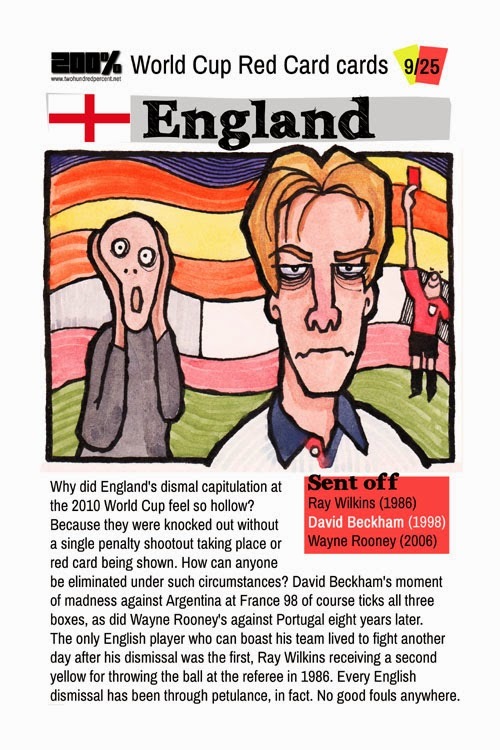 The latter of those tournaments was significant as it was also the first World Cup since yellow and red cards were introduced to international football and although the red card didn't make an appearance until four years later, it has since been shown 137 times. This equates to a rate of 0.25 red cards per World Cup match, or one every four games. In the last three tournaments, this has risen to one every three. Since three games is the minimum number that any team who qualifies for the Finals can play, you are now statistically more likely to have a player sent off than not. If you go further than the group stage and still don't have any players dismissed, you're simply not trying. Days like 18th June 1998, where five players were sent off in a single round of group matches (Denmark v. South Africa and France v. Saudi Arabia) or 25th June 2006, the day of the second round match between the Netherlands and Portugal in which 16 players were booked and 4 sent off are starting to look less like aberrations and more like the norm. All of which is great news for me, until you remember that whilst dismissals are trending unrelentingly upward, goals-per-game are falling fast. Just as fast as dismissals are rising, in fact, or moreso. At the current rate, by the 2142 World Cup at the very latest we can expect more red cards than goals in each and every World Cup game. I drew a graph and everything, so this is definitely going to happen. I mentioned my rigorous researches on Twitter and Terry Duffelen, Fußball correspondent on Twohundredpercent and eminent football podcaster, remarked, "red card coefficients are the future of football", a thought which was the perfect combination of funny and bottom-clenchingly terrifying. Because if red cards are to become the game's new currency, we can expect teams going through elaborate simulation in order to prevent their opponents getting sent for an early bath. And while their own tackling would reach new heights of ferocious overkill, the players on the receiving end would react with such Gandhi-like equanimity and calmness that the referee won't know what to think. No-one would get sent off at all. Combine that with there being no goals either and every World Cup game would essentially be like watching Brighton and Hove Albion: you're slightly drunk, it's raining, nothing is happening on the pitch and you don't know where you're supposed to sit. The only way to prevent this ludicrous situation from occurring is to send everybody off before the game has even started. This is something I'm sure we can all get behind.